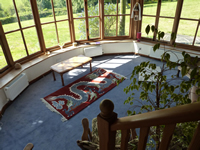 Maitreya House is a beautiful retreat centre located in the south west of Herefordshire. The peaceful and nurturing atmosphere make it a wonderful space in which to receive Healing-Shiatsu. BY ROAD: from either Abergavenny or Hereford take the A465. At Pontrilas which is about halfway between the two towns, take the B4347, sign posted Ewyas Harold, Abbey Dore, etc. Then take the first on your left, immediately after having crossed a small bridge, towards the centre of Ewyas Harold village, sign posted Longtown and Dulas. After about 3 miles turn right at signpost of Lower-Maescoed. There is a dog kennel sign on the corner. Proceed for another half mile and turn right at the phone box. You will pass the Orchard on your right after about 100 meters, and just go round the corner where you will see a red fence and gate. This is Maitreya House. Park on the green facing the trees. From Hay-on-Wye take the B4348 to Peterchurch. A few miles after Peterchurch take the B4347 to Abbey Dore and Pontrilas which takes you to Ewyas Harold (see above). BY PUBLIC TRANSPORT: the nearest railway stations are Hereford and Abergavenny. Coming from the north, aim for Hereford; coming from London or the south, aim for Abergavenny where you can get a taxi to the centre. Jorgen is our local man who knows us well; details below. If you don’t have a car we strongly recommend that you get in touch with someone else on the course travelling by car and is able to give you a lift. 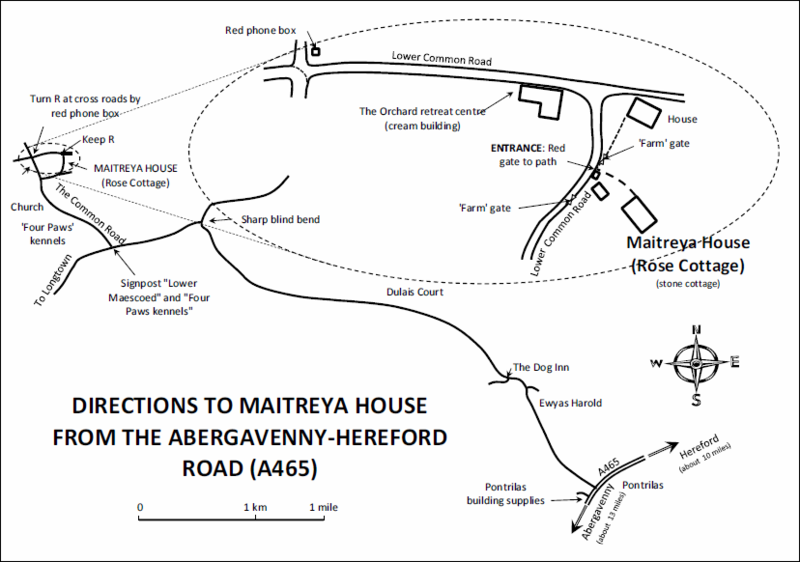 You can also get a taxi from Hereford or Abergavenny (bring directions with you!). Our local taxi driver, who knows the centre and is very reasonable is Jorgen: Mobile number: 07535 554072 Call in advance for pick up. Mindfulness In Shiatsu By Sonia Moriceau.